The scheme is being run by Jim Bowen at Clynfyw Care Farm in Boncath, where the Wheelie Good Idea community project was set up last year. Clynfyw Care Farm, Abercych is seeking help to build on the success of its Wheelie Good Idea, which has already changed hundreds of lives. The organisation’s first container full of six tonnes of refurbished mobility aids and wheelchairs has recently arrived in South Africa and plans are well in hand to get another ship load sent out. It’s called ‘Wheelie Good Idea’ because one of the first fundraisers for the community based project was a sponsored push of wheelie bins at the farm. More than £1,300 was raised. 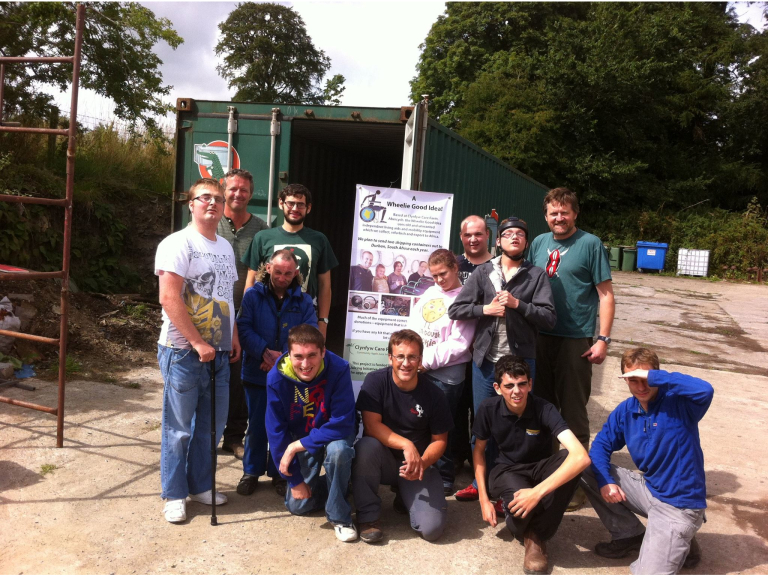 Now, Clynfyw has turned to Crowdfunder to help fund the second container of more than £100,000 worth of equipment. The Wheelie Good Idea project collects donated and salvaged wheelchairs, mobility aids, bicycles, tools and computers. They are refurbished and sent in shipping containers to the farm's Durban based partners, where they are processed and distributed to community groups throughout eastern South Africa and southern Mozambique. Nothing is wasted – the containers themselves are also used and are converted into premises for schools, crèches, community hubs or medical centres. Jim Bowen says that each piece of equipment really can change a life. “We need £5,000 to buy and ship our next container. Over £100,000 worth of equipment went into the last one, so it’s a great return,” he said. Clynfyw already has enough donated equipment stored to send another container, and with the aim of keeping this a truly community based project, they have turned to Crowdfunder to help finance it, but this project will only be funded if at least £5,000 is pledged by 3.57pm on May 22nd – so the race is on.